We come from the city of Iwai in Ibaraki Prefecture. We are here to perform the hula, Hawaii’s traditional art form. We look forward to meeting the people of Hawaii and making friends through our dance. We learn the art of hula with sincerity based on our motto, “Healthy body and spirit”. Hula is our life! Each day we have fun, improving, to be able to show you our traditional style of dance. We hope to feel the deep emotions of this Hawaiian culture. Our group enjoys the playing the Taisho Goto, a traditional Japanese instrument. We enjoy playing various types of music, however we emphasize preserving the older songs of Japan. We also enjoy playing Hawaiian songs. Please come and listen to our music. 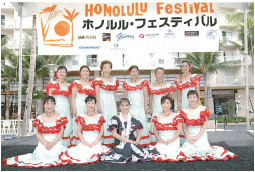 The goal of the hula dance circle Lei Aloha Ayako Hula Hui is to enhance seniors wellbeing through the activity of dancing hula. We actively practice in our hometown Maebashi City, Gunma Prefecture, and also in various neighboring communities. Osaikumono is a traditional Japanese handicraft, whereby small pouches or dolls are made from pieces of Kimono fabric. At the festival, we will exhibit our artworks featuring Hanging Hina Dolls, which are displayed to wish for girls’ healthy growth. We would like to share not only our sewing skills, but also our heartfelt care for children that is symbolized by these crafts. Carrying on our late kumu hula Kaulana Kasparovitch’s hula style, we teach and promote hula in Japan. Now we practice even harder with our new kumu hula, Keale Nalani. Today, we will do our best to dance hula, even though some of our members are less experienced. Please give us your generous attention. Experience Studio Ho’aloha’s elegant dance moves as they perform the traditional Hawaiian art form of hula. Ho’aloha means ‘beloved friends,’ and they hope to expand the chain of friendship. We are from Miyazaki Prefecture in Kyushu, Japan, where we have beautiful ocean and mountains. Three fertile rivers run through our hometown of Nobeoka. We work hard continuously to preserve Japan’s wonderful tradition “Kimono Culture” to the present day. Since we both live in an eternal summer climate, we thought it would be nice to exchange friendship with people in Hawaii through our “Kimono Culture”, that made us decide to participate in the festival. Please do come to see us. We, the four classes of Nagoya Mainichi Bunka Center, are participating in the Honolulu Festival as a celebration of our 50th anniversary. We hope to draw a lot of people to the festival to enjoy our Kimono-dressing and Nagauta (Song and Shamisen) on stage. At the same time in the exhibition area we will demonstrate Necktie reforming and show some wonderful miniature garden stones. Please enjoy our performances and exhibits.